Impressive that you have 63 miles, considering the number of toys surrounding the treadmill...that could make running potentially treacherous! You never know where a little train or plastic piece of kitchen food will turn up. Still loving the paint job, though. Nice work. And fun new layout for your website. 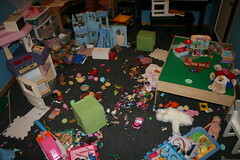 hey, this is what the playroom looked like when we were there. no biggie. that is what they are for!! 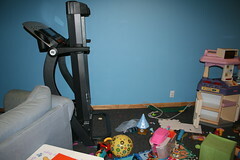 i think i might want a treadmill, but I dont want the kids to mess with it. so i guess i will just walk around the block. :) well done on your 63 miles!